A little topic to present my new e-motorbike. I've purchased it a week ago, already changed the original yuyang king controller. Currently, the 150A sabvoton is installed in the machine and gives very decent performance and I'll test the Kelly very soon. It's a pretty decent machine, the battery could be lighter of course since it is SLA, lithium being a bit too much expensive for me at this time. So far I'm pretty satisfied with it. In a near future, I'll probably swap the motor for a high torque version and go for at least 96V to compensate for speed loss. I think this machine has a lot of potential, the frame is pretty lightweight, it handles great, there is plenty of space for the battery, according to my taste it looks gorgeous and the suspension is quite comfortable, at least much more than my scooter's. I just hope I'll be able to convince myself to invest on a big lithium battery, but I don't really get all the battery management system part, especially when it comes to very high power settings. I would love to build my own 120V lithium battery for this, using prismatic cells. Just no idea how to make it safe for now. Last edited by Dui, ni shuo de dui on Apr 01 2019 9:41pm, edited 2 times in total. Nice. What model is that bike originally? macribs wrote: Nice. What model is that bike originally? I've been looking at importing one of these Chinese electric motorcycles into the UK. Can you tell me what the model is of yours? swiftyds wrote: I've been looking at importing one of these Chinese electric motorcycles into the UK. Can you tell me what the model is of yours? You will accomplish exactly nothing by swapping to a slower wind version of the same motor. "High torque versions" are absolute myth. The reason is the windings are longer and thinner copper, so they handle proportionately less current for the same amount of heat, and heat is our hubbies' true limitation. If you change your existing motor to a smaller outside diameter wheel and up the voltage, then you will have accomplished something that gives you greater performance. I'm not sure what makes you think that torque motor is "a myth". I tried various versions of QS motors, torque/balanced and speed and I can tell you that there is a difference, both in torque, speed and power consumption. Changing my motor for a smaller diameter is really not an option, since it would totally ruin the bike's balance by making it lean on the rear wheel. It would look very weird, give a lower ground clearance and affect the handling. You might wanna consider taking John's advice. He knows. I noticed you got SLA batteries. If you swap that battery for a proper e-battery you probably would have both lighter weight and faster discharge times. Meaning your battery can deliver more current faster to the controller and in the end to the motor. You could look into either hi qual li ion cells like 30q from samsung or VTC5/6 from sony. Or be adventures and have a look for lipoly. I am not dead certain on the SLA performing thingy, but that could sure be something to look into and gather more info. Probably better putting money into where you get a better return then spending money on yet another motor just with different winding. SLA have a great discharge rate, at the expense of the capacity. I could have a bit more performance swapping to lithium in terms of acceleration, but that would mainly come from the weight loss. About lithium, the only option I would consider is LiFePo4. I use my machine everyday to go to work, charge it overnight, so I don't want to take any chances with fire hazard (I've seen many ebikes burn and had a few friends who had pretty big fires using Li-ion and Li-Po). Plus they are way more reliable on the long run. Well, that's not really the same kind of money. A new motor costs about 2000 rmb. A decent battery would cost at least 10 000. But yes, I'm looking into this. Actually, I would like to build my own battery, but I cannot find a really good thread about BMS systems. I would need to build one from scratch since Chines BMS are notoriously unreliable, but I havent' seen any good tutorial about that. I wonder if this could be done with an Arduino and a few components, never seen anything like that yet but that would be great. You noticed changes because you didn't make all changes needed for a fair comparison. The torque limits of a motor are based on it's steel and magnets. How the copper is wound only changes the voltage and current to get there. 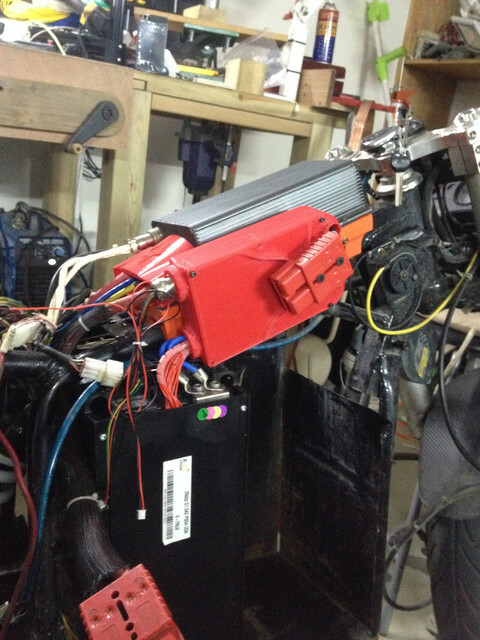 So-called "torque" versions are simply wound to a lower Kv. While that gives you increased torque per amp, it proportionately decreases the amp limit, so it puts you back in the same place in terms of power except that you have to use a higher voltage to get there. 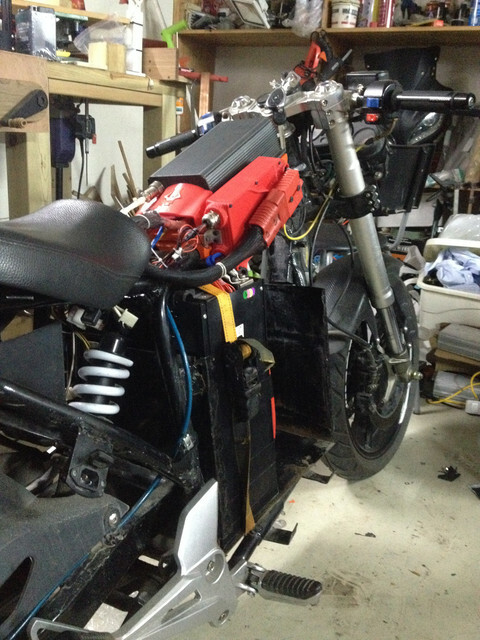 If you want to mod your bike for greater performance, then make motor cooling modifications so you can run higher power at the same temperature. Stubbornness rarely trumps science, I know as I time and time again started down the samt path. Add that money and they money spend on wrong parts, either by rush impulse trading online, or by trusting an old brain for measure/size and order based on sa(i)d memory and I am certain I could have a very decent ready made fully assembled e-bike delivered to my door. And if you look around the forum you will find many other people who also started down the same road you are about to embark upon, swapping to "hi torque". After considerable money spending, time wasted etc most do change their minds in the end and trust what others have tried before them. SLA might have great discharge rate for all I know, but they are bulky and heavy as a motherfcuker. For the same volum of batteries you could fit larger li ion battery and save weight. Even higher discharge and lighter weight now that is a win. Lifepo is very 2013. There are thousands of bev's from bikes to scooter/motorcycle to cars, buses and trucks running day after day for a decade without fire hazard. Main thing is to monitor and manage the charging, discharging and have a correct working bms or controllers to cap high voltage and low voltage. Never charge to 100% try to charge to 80-85 % and never drain battery completely and you will be sorted. I know li ion batteries are expensive, but could you possible find salvaged Tesla cells, or maybe second hand Nissan Leaf cells? Look at it this way. Battery cost is something we all struggle with. And sometimes we just don't have the money for it. Now you got a well working SLA, try sell off the SLA. IF you are lucky you get some dineros for the SLA. Don't spend that 2000 rmb on a new motor. Say you can score used Tesla cells for 6000 rmb, maybe you can get 1000-2000 rmb for your SLA battery and factor in that 2000 rmb you save for not getting a new hi torque motor. Possible you can also get some change by selling two of your controllers. If you are lucky you can spend 2K on a new motor or 3-4000 on a better battery. If battery is no go at this time, by bigger motor or maybe even mid drive rather then buying more of the same expecting new results. Once you go lithium, you'd never even consider going back to lead batts. Stubbornness rarely trumps science, I know as I time and time again started down the samt path. I know that swapping my motor for a high torque would help me to get a better 0-30km/h acceleration. I was not asking for directions there, it is just a fact. If I don't change anything to my configuration and replace my motor for a torque version, I will have a bit more startup power. I've done a lot of electric scooters, helped countless people to build their own, so I know what I'm talking about. John is theoretically right: If I would ever reach the current limits of my motor, this limit would be lower with a torque motor. Indeed. That is absolutely true. But the fact is: my controller doesn't reach the motor limits just yet. The motor barely got to 70 degree C during the hottest days of summer, after long aggressive rides. In addition, my current motor seems to be a V2, changing would allow me to go for a V3 which have more beefy wires used for the windings. Hence, higher limit. Not mentionning I could go for a watercooling system, it's super easy to build. Anyway, I'm not a complete noob on the subject, what John says is right, but he doesn't take into account my actual situation. SLA might have great discharge rate for all I know, but they are bulky and heavy as a motherfcuker. For the same volum of batteries you could fit larger li ion battery and save weight. That's what I would like to do at some point. But this is actually an area of which I'm quite a noob: building a BMS system. If I ever manage to understand how this thing is supposed to work in details, I would for sure build my own battery. So far I completely understand the theory, but I struggle when it comes to what actual components to use to build one from scratch (since here, in China, it is nearly impossible to find BMS able of handling more than 150 Amps. Plus I don't really trust their BMS). Maybe. Yet it is safe, stable, relatively inexpensive and has a very long lifespan. 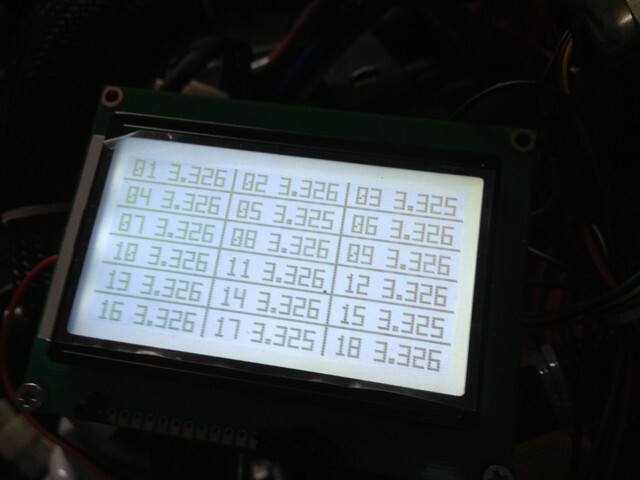 The only issue is that it is a bit heavy and that the C-rating is not the highest, but my goal is not to build a racetrack machine to ride side to side with Valentino Rossi, but simply to get about 60-80km of range, have a bit less voltage sag during the acceleration to slightly improve performance, and finally, be able to charge it every night without being burned to death. There are thousands of bev's from bikes to scooter/motorcycle to cars, buses and trucks running day after day for a decade without fire hazard. Main thing is to monitor and manage the charging, discharging and have a correct working bms or controllers to cap high voltage and low voltage. Never charge to 100% try to charge to 80-85 % and never drain battery completely and you will be sorted. BMS and chargers are not 100% fail safe. I've seen some of them failing at monitoring cells properly, which ended up in fire. Even some very experienced people here had issues with "state of the art" protection systems. I don't need and I don't want to take any chances. I prefer a proven safe technology, even if it means less performance. Here in China, we don't have fancy insurances and stuff to cover our asses whenever something goes wrong. So If I burn down my house, I have to pay all my life for that. It just doesn't worth it. Plan was to change both. But yeah, first priority would be the battery. For the motor, that was just to improve a bit the starting torque, but I would lose quite a bit of speed, which, as it turns out, I'm pretty used to now. 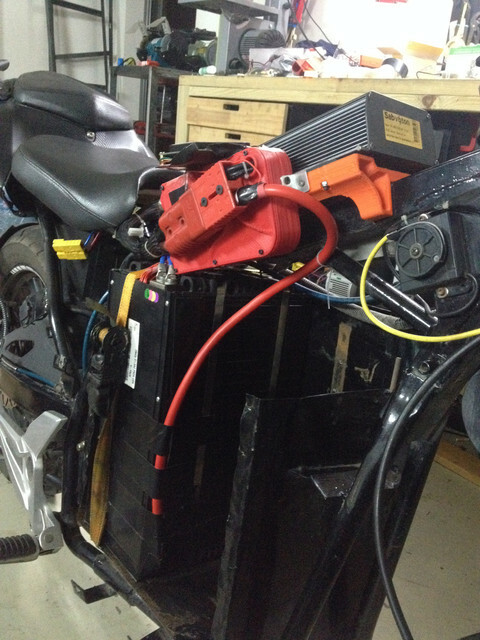 I have a huge 72V 50Ah lithium battery on my electric scooter. It is nice, but it could not handle the current demand for a continuous 200Amps controller without cutting instantly. I'm currently at the very limit of this battery using a 150A sabvoton. If I push it to 160A the battery would cut. You don't have that kind of problems with SLA, it just lags and reduces your range and perfs. Also, SLA are dirt cheap and easy to work with. So it really is a matter of compromizes. For a high perf, dirt cheap, low range machine it may be a nice choice. High performance and lead simply don't belong in the same sentence. Regarding some low power craptastic lithium scooter pack, I wouldn't waste my time. I use automotive grade cells to build my packs, so I get safety, high power, long life, and low price all in one package. In the long run the lithium I use is more economical than the cheap lead anchors you want, so there's no upside to those toxic lead batteries that a polluting China so badly now. I use automotive grade cells to build my packs, so I get safety, high power, long life, and low price all in one package. Where do you buy your "automotive grade cells"? there's no upside to those toxic lead batteries that a polluting China so badly now. Did you ever see where neodymium comes from? 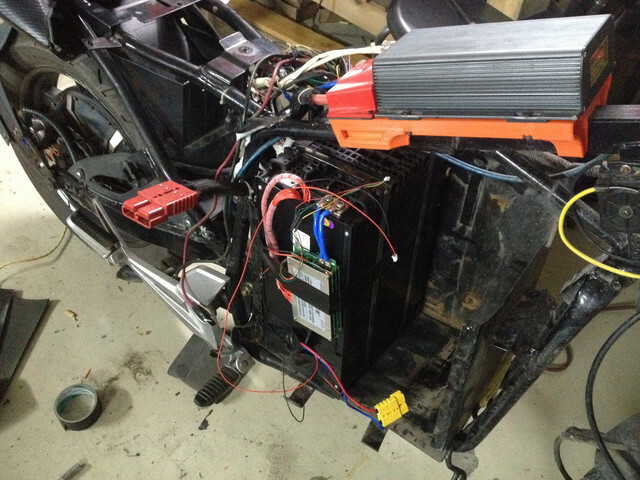 Well, yes, you can build some high performance stuff with lead acid batteries. 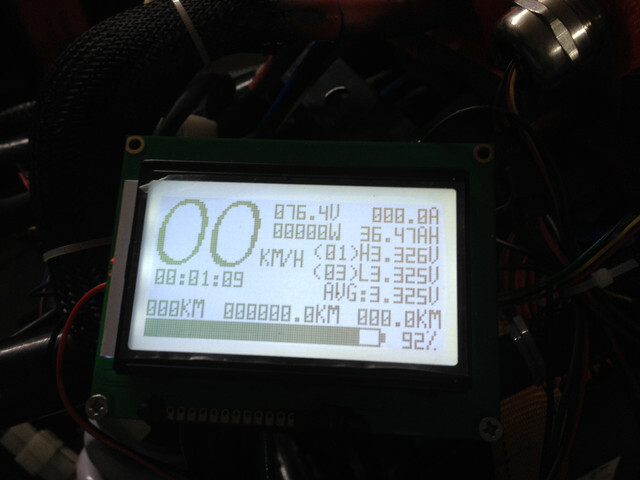 A friend of mine has an electric scooter capable of accelerating from 0 to 100km/h in less than 4 seconds, using 120V SLA. 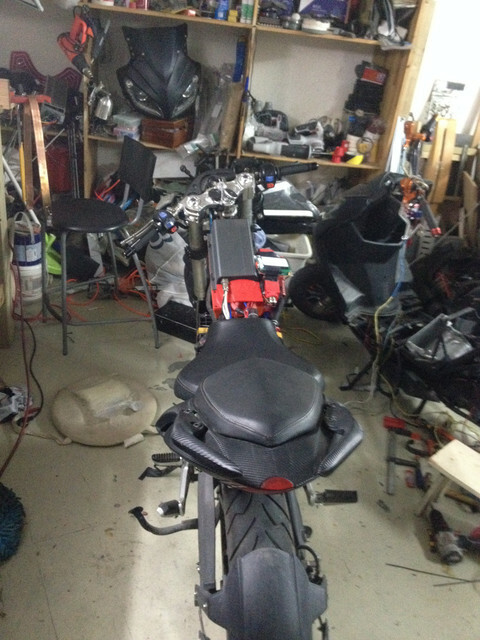 That's quite a nice performance from my point of view, especially considering the fact that it cost him less than 700 USD including the scooter itself (so about 400USd in parts-motor, controller, battery, DC/DC converter and a few other stuff), but of course there's always better. You could do that with lithium too, but it would cost more than 4-5 times the price. I never said that was the best solution, but it works nicely. And here in China, SLA batteries are just dirt cheap. 120V 20Ah is about 100-150 bucks. They generally last about a year, but you can resell them since they are recycled, which cuts down the price by about 20% when buying a new set. Sure, it might cheaper to buy lithium in the long run (as long as it doesn't crap on you), but not everyone has the cash flow to support that kind of one shot expense. Here in China, finding decent lithium cells is actually quite a challenge. And you just can't buy used batteries from the junkyard, I tried once already. I made quite a few mods on my bike recently, so I thought I'd share it with you guys. So, I've bought a new lithium battery. It's a 23S 2P (76V 40Ah) lithium battery made of A123 20AH pouch cells (LiFePO4). 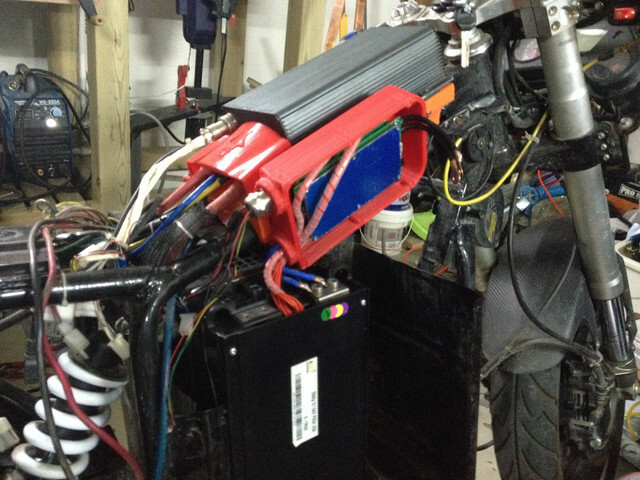 Apparently the battery was designed to go in a pickup truck (this one: http://www.hybridcars.com/2014-via-vtru ... ve-review/ ). I don't know if this truck made it into production or if it just was a show car, maybe some of you guys have information about that? Cells seem to be pretty well in balance. After a 5-10 minutes ride they are all exactly equal. So I've finished the install yesterday night and so far I've been able to test it for around 20-30 km. The power is just mind blowing now. 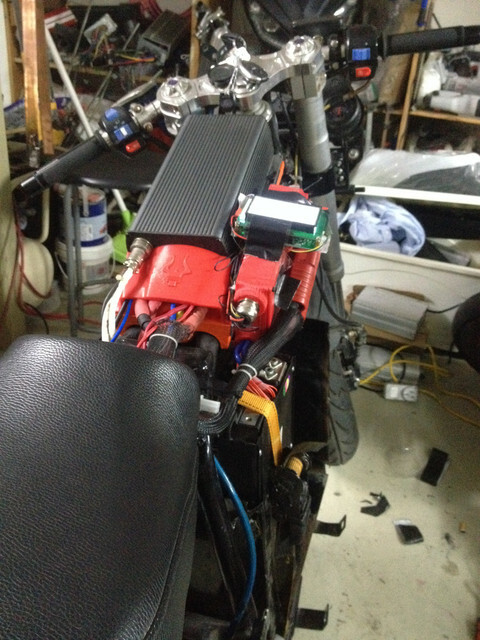 I've set my controller to only 350A phase current and 150A battery current and it already accelerates about the same with my 400cc Honda Hawk (mainly because it is 40 kilos lighter than before). I'll test it with those settings for an entire week and then crank up the power to 450A phase current and 200A battery current since the sabvoton is able to do it. Currently the max speed is about 115 km/h (I can go higher using the flux weakening, I guess it could reach 130km/h easy despite the relatively low voltage), and I don't have acceleration figures yet but it should be pretty good. Only the very beginning of the acceleration curve still seems a bit weak (from 0-10 km/h basically). I don't care that much anyways since I'm not really a wheely kinda guy. 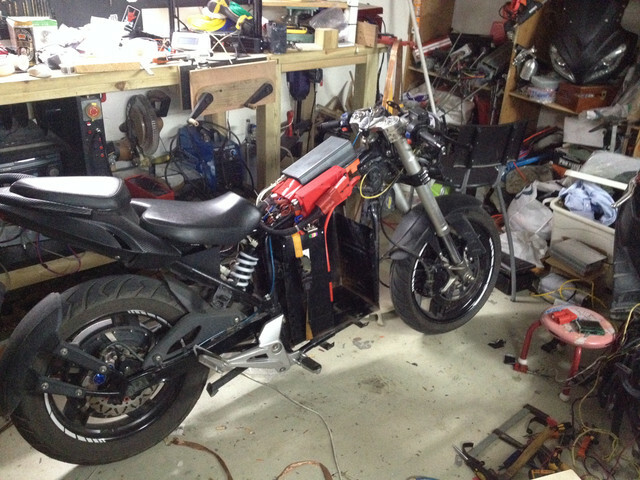 Now the plan is to make sure that this battery is reliable, ride for a month and then add an other one, since I have enough space. So I've been riding for a few weeks by now. I've set up the controller power to 210 Amps battery continuous and 450A motor phase. It is a beast, so fun to ride! The only little thing I'd like to change is that it lacks a bit of power on the low part of the curve. From 0 to 30-35kmh the controller doesn't seem to throw all its power so it starts a bit slowly. I have no idea if someone managed to change this somehow in his sabvoton controller? But passed this point, it seems to accelerate more and more until I reach the top speed (120km/h). I made a few runs against 250 and 400 cc bikes and while they took of quite a bit faster due to the controller issue I've described earlier, my electric bike smoked them all with its impressive torque at higher speeds. The battery doesn't seem to have any hard time at 210 amps, and I 've get an impressive 75-80km range with a relatively aggressive riding. All cells stays in balance, it doesn't heat much, it charges well, regen works fine... Really nothing to complain so far, it is amazing. Are you getting any overheating issues with the BMS running at 200A? I'm designing my new build and I need to push 250A battery and 450A phase. I have the same BMS but I'm a little worried about cooling issues. Well so far not at all. It's horribly hot in China these days (around 39degreeC) but the worst I've seen the BMS yet was about 42degreeC. So pretty much no difference at all. It gets hotter during charge though, but I think the max was about 58-60 degree C while balancing. I still need to dig a bit more in the settings to see if everything is set up properly, but since it apparently worked perfectly fine in the past few weeks I don't think anything is wrong. Controller and motor heat are now my only concerns, they are working pretty hard. I recently bought some hub sincs. I was a little dubious about their claims but I thought I'd try them anyway. My MXUS used to get to the point of thermal throttling (>95c) but now, it barely gets warm! Maybe you could find them more local - it's definitely something to consider. This wouldn't work on my bike since it is not the same kind of rim. In addition, what really matters is the stator heat. Depending on your settings, the stator could reach critical temp even if the rotor is cold to the touch, reason being that there is almost no direct heat path from stator to rotor except through the bearings. Most of the heat is transferred from one to another through radiation and convection, which is far less efficient. It surely helps to keep the rotor cold, but do not expect miracles here, only actual cooling of the stator can really make a big difference. The best way to get better acceleration with any hubmotor is with a smaller wheel, because it's reducing the gearing of the motor which will result in the added benefits of running more efficiently. I don't know how much smaller outside diameter tire will still fit your rim, but even a 10% change can have a surprisingly big impact. The benefits are across the board because you've decreased system stress. You can make up the difference in top speed with flux weakening. If you're not having heat issues already, then increasing phase current is also an option, but monitor heat after the change. Increasing phase/battery current limit ratio results in more take-off acceleration at the cost of added heat. If the controller has more to give, and you can fit a smaller wheel, then you can pick up a nice double shot, by using some of heat reduction resulting from lower gearing and adding the heat back due to higher current. Shorter acceleration times help, since the length of time at the higher current is less.